Huh, I think both of these would be more interesting if they didn't take the Artifact in such a similar way. Yeah, that's definitely lame. I came up with a new condition for taking the Pipe. And when are you going to have Pipe and not have at least a few good cards in hand? 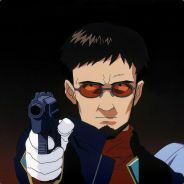 I don't follow you here. Do you mean Staff?. Because once you have Pipe you want to play as many Hobbits as possible and draw as much green as possible. Good cards don't interfere with that. Did you consider just masquerading a single card? It's not hyper strong, but should be fine if you buff Wizard itself at the same time. 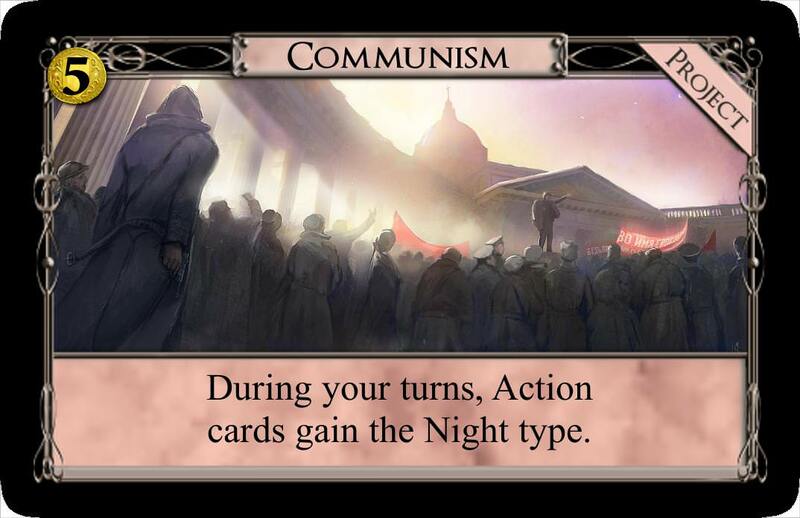 Needless to say, the card is political in multiplayer; you can gamble and exchange your hand with the hand of whomever has more green in their deck. But I don't mind a bit of anti-king-making in Dominion. Mechanisms that mitigate the scissors/Matthew effects is something I appreciate in games. I opted to go for something in between your suggestion and my original idea: up to 3 cards. Now it is impossible for both players to pass an unequal amount of cards and handsize attacks don't backfire anymore. I believe the “for” wording is only used for optional effects. Sounds awkward on Wizard. Could either be optional, or just 2 separate instructions. I like the changes to Hobbit and Staff. Yes. I meant Staff, not Pipe. This is the Villager version of Asper's Conserve with a fix that LibraryAdventurer suggested. I hope that this is not as broken as Conserve turned out to be, Villagers should be weaker. Conserve was broken because it allowed you to buy Provinces without building a deck. Villagers don't have that problem. Seems good, but I don't know if it's good for its name to match a card type. This idea is thematically inspired by the recent cards with an insanity theme by Kudasai and Fly-Eagles-Fly. Whenever Bedlam is in the Kingdom Healing is a mandatory Event. Lunatic and Insane are two sides of the same card, like Miserable and Twice Miserable. The key idea here is to do a harsh permanent Attack that you can defend against relatively easily via Potions which you want anyway to get the card. So while the Kingdom card doesn't directly defend against itself, when you choose to go down the Potion path you get both attack and defense. Then I settled on the Potion card having to be relatively expensive such that you sometimes cannot afford it and take the Medicine en passant more often than you would if this costed $2P or $3P. I already had the "Coffers into card draw" idea for some while but it was far too strong for a $5 (there is probably a good reason for why no official card produces more than 2 Coffers) so it was a natural match for the expensive Potion card. Great cards Do you have any plans to make your Conjuration states into Artifacts? Just curious. It would require a thematic overhaul (e.g. Loveletter-Beguiled) and Thoughtful is the Key anyway so I guess not. 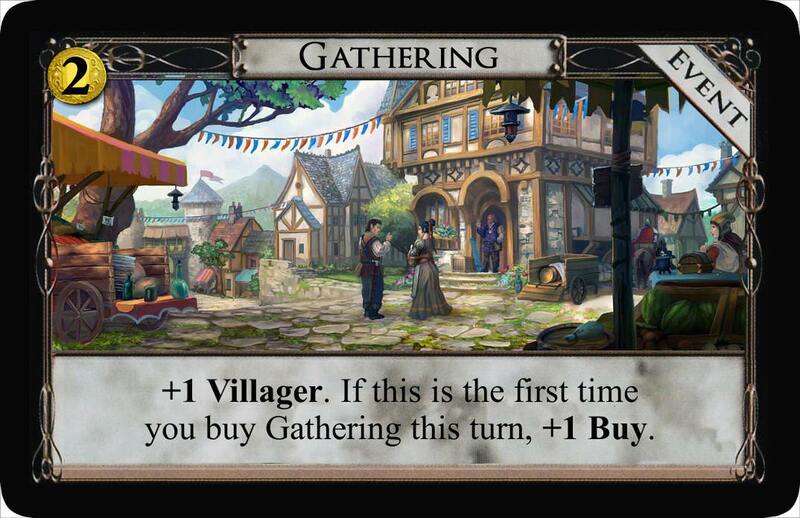 Asylum was a Village card that rewarded players for buying it on one of their first two turns. I only called it Asylum as a joke, because it's often regarded as crazy to open with a Village when you really don't need it yet. 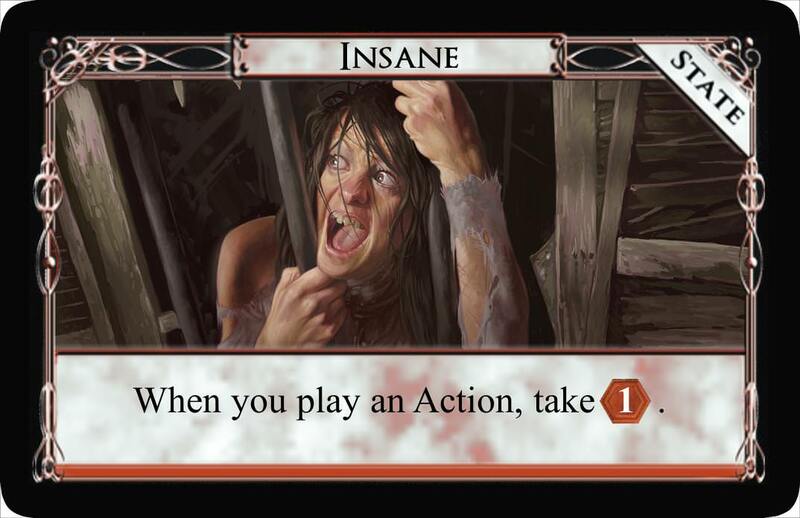 It was really a bad joke and that's why I renamed it rather quickly afterwards, but now I guess it's spawned a bunch of insanity themed cards, which I think is both hilarious and amazing! Well, I guess the big question with these is does it hurt Engine play enough that players will just avoid it altogether. Lunatic and Insane are brutal States and including a way to remove them was certainly a wise choice! There are a lot of interesting choices a player could make with Healing. Namely, how many Potions do you grab? I'd be inclined to grab two (something I'd normally never do) just to avoid even Lunatic. But is all this worth it if my opponent just goes Big Money or Draw Big Money? I guess the answer to that lies in the on-play effect of Bedlam. +3 Cards certainly doesn't justify the $4P cost and I'm unsure if +3 Coffers does either. Of course you can mix and match the number of Cards and Coffers you get, which adds a lot of value, but again I'm not sure how much that helps. Do you think Bedlam in its current form can beat Big Money or Big Money Draw? This is just a hunch, but I think with poor shuffle luck (i.e. getting $3 and a Potion hands) Bedlam would lose. Interested in finding out though! (1) Bedlam can just say "tokens" and not "Coin tokens". (2) For Healing, I think the second sentence should be in parenthesis. 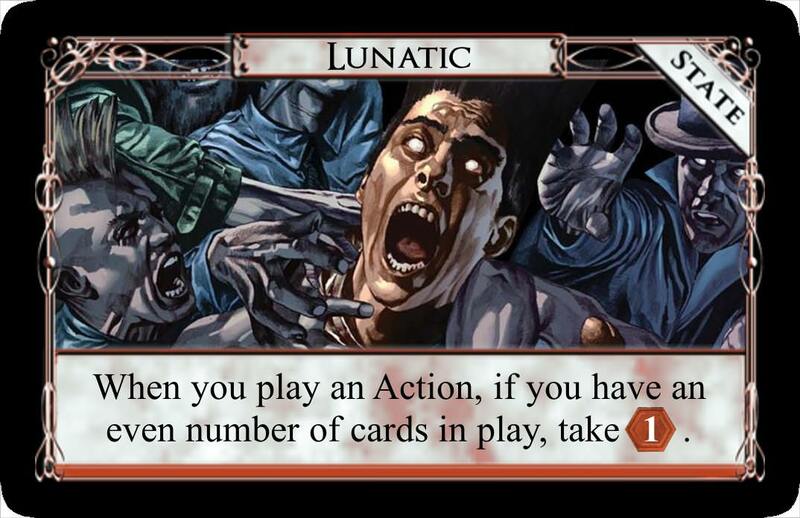 I think Lunatic and Insane would be more thematic if they did something random. Like maybe Hexing you at the beginning of your turn? 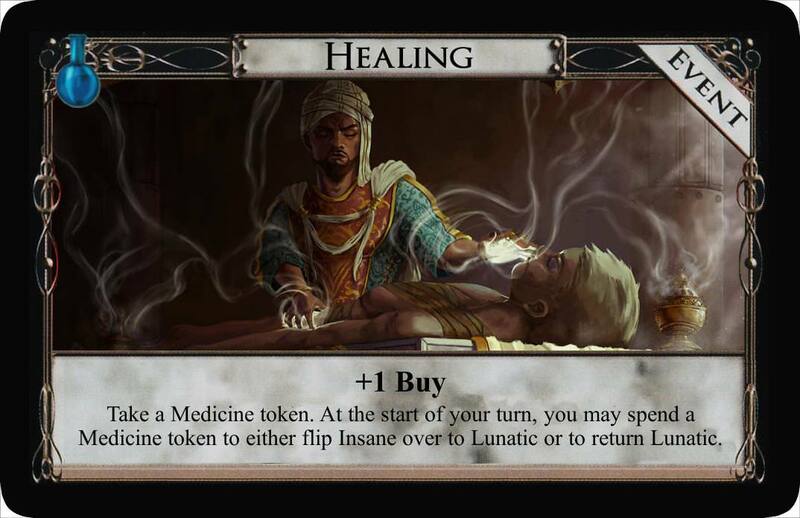 There are a lot of interesting choices a player could make with Healing. Namely, how many Potions do you grab? I'd be inclined to grab two (something I'd normally never do) just to avoid even Lunatic. I don't know how it will turn out but one idea behind Healing is to hedge against bad shuffle luck. So if another player got Bedlam earlier you can at least defend once against the Attack. Yeah, that's the problem. Once I test it I will try it at $4P and $3P but this could go nonetheless go down the drains as Bedlam could be one of those cards that is too strong and too weak at the same time. Here's a thought I had on a potential buff for Bedlam/Healing (if needed). 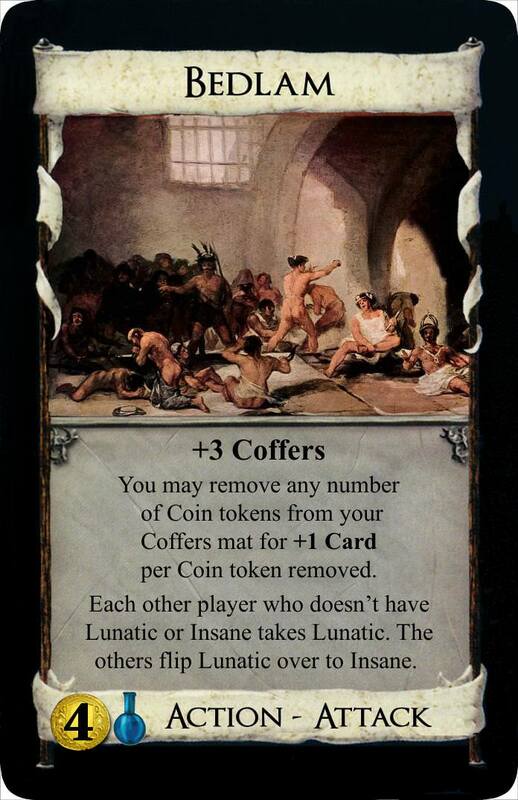 Instead of increasing Bedlams Coffer output, add a choice to Healing for Coffers gaining or Medicine Tokens. The Potion cost seems like a good fit to keep a Coffers gaining Event from getting out of control. Would certainly make Bedlam much stronger against Big Money and thus make the whole Bedlam/Healing/Lunatic/Insane train have a reason to start in the first place. This is definitely a good idea to bump Potion/Bedlam in non-mirrors. I only have some slight general reservations about cards that hedge against the "Potion risk" (e.g. something like "Choose one: either +P or +2$"). But this is after all the main idea of Healing, just that it hitherto only provides a resource that defends against an Attack and that is worthless if nobody else goes for that Attack. 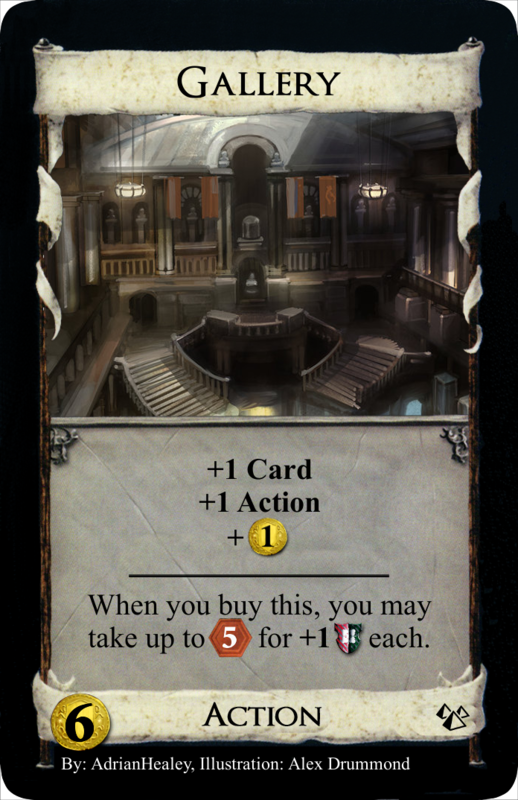 I was a bit sad that overpay did not reappear in Renaissance, it is not a difficult mechanism and there is stuff you could do with it and the tokens. Marketeer is simply another name for a Buy token (that you can spend at the start of your Buy phase for +1 Buy); overpaying for VP tokens obviously doesn't work (on a Victory card, this card by Theta and AdrianHealey does work). The anti-Copper clause is there to prevent endgame shenanigans with total Coin transfer; I don't like the enusing overall wordiness though. 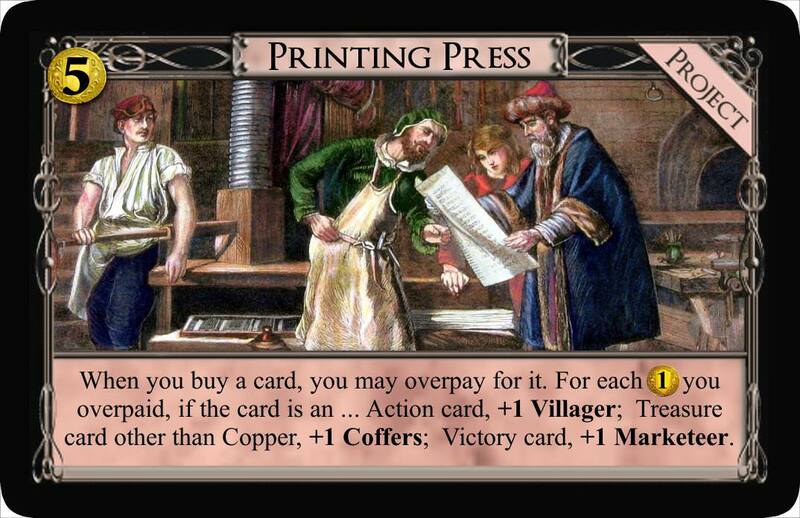 Printing Press could be good enough to cost $5 and could be too similar to Academy, Guildhall and Spices. Both cards are part of a split pile with either 4 of each in a two player game respectively 6 of each in multiplayer. Timber Raft could be good enough to cost $3. The base price of Riverlands is just a first shot, hard to determine this without playtesting. Riverlands could be in principle too strong. If you manage e.g. to play 3 Timber Rafts and 3 Treasures the first one costs only 1, the second one 2 and so on. Twitching the base price only gets you so far which is why Riverlands is then up for elimination. Its idea is mainly to make Timber Raft better but perhaps this is already good enough on its own. EDIT: Timber Raft costs $3 now. Yeah, I think this is pretty strong, especially considering the Coffers for the non-Copper Treasures. There are many instances where buying a Silver for 4 or even 5 is a good move without the Coffers bonus, and let's not forget $7 or even $8 Golds. In fact, I could see myself going for a Silver for $6 and taking those 3 Coffers over the Gold easily. As you said, this can compare to Spices, to the point where Spices is almost obsolete in Printing Press games apart from the +Buy. I like that you are bringing in Marketeers, though. More token uses! By itself, Timber Raft would probably be okay at $2. Apart from Goons, you rarely need all those Buys. Also, you need to reliable get those non-Coppers in your hand to make it work, so Timber Raft doesn't become all that good until midgame at least. With Riverlands, though, you are right that this could get shenanigan-y really fast. In your situation with 3 Timber Rafts and, let's say, 3 Silvers, it would take just $10 to wipe out the Riverlands in a 2-player game. You have $6 already, and with a decent engine, the other $4 shouldn't be too hard to get. This then becomes effectively a race to raid the Riverlands... Never mind, I love it! Alt-VP for Life! In any case, make sure to add a "but not less than $0" clause to Riverlands. Moreover, the whole idea of a split plot with 4 or 6 of the non-Victory card is just weird, and I usually like weird. 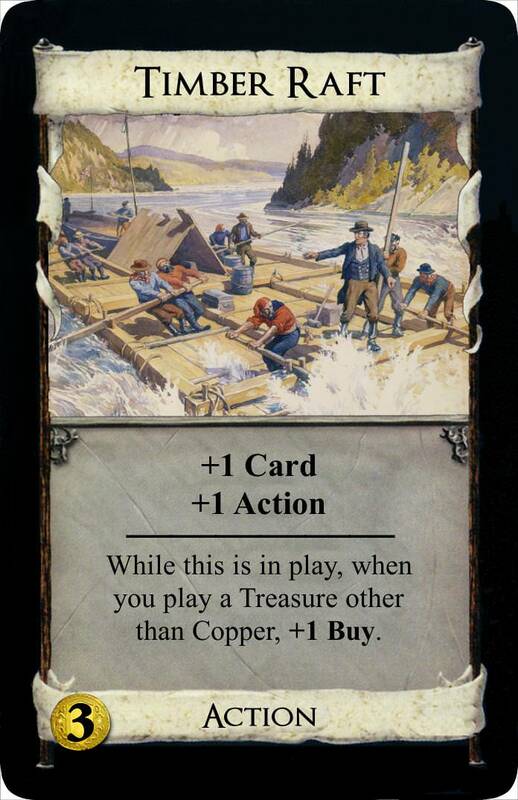 Is it truly necessary for Timber Raft to have 4 or 6 cards in the Supply rather than 5? Note that the price of each subsequent Riverlands increases by 1 as you then have one Buy less. There are two reasons. First, to enable even splits in 2P games. Second, to scale the Victory cards normally. It is half a pile so instead of 8/12 Victory cards it contains 4/6. I already noted that by saying it would take $10 to buy 4 Riverlands, though I admit that my math was wrong here. 3 Timber Rafts and 3 Silvers means each Timber Raft grants 3 Buys for 9 Buys total. Add to the one you normally get (and I forgot to add), and that's 10 total Buys. 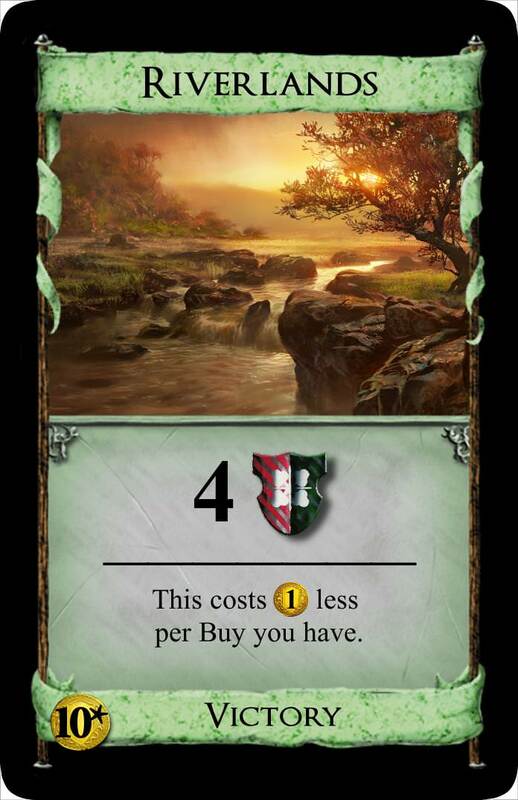 I had it as 9 Buys total, so the costs per Riverlands would be 1+2+3+4=$10. Correcting my math, it's now 0+1+2+3=$6 for 4 Riverlands, which 3 Silvers provide. I'm not talking about Riverlands here. I understand the half-split for that. I'm talking about Timber Raft, the non-Victory half of this split pile. Most non-Victory Action cards have piles of 10 or split-piles of 5 (Port and Rats being the lone exceptions). I know that Timber Raft is paired with Riverlands, which should be 4/6. However, is it completely necessary to make the non-Victory Timber Raft 4/6 as well, when this doesn't happen with any other non-Victory Action card? Perhaps the split-pile quantity issue would be less confusing if Timber Raft was an Action-Victory card itself. Most non-Victory Action cards have piles of 10 or split-piles of 5 (Port and Rats being the lone exceptions). I know that Timber Raft is paired with Riverlands, which should be 4/6. However, is it completely necessary to make the non-Victory Timber Raft 4/6 as well, when this doesn't happen with any other non-Victory Action card? I believe that Dominion would scale much better if all Kingdom piles (or at least the crucial ones which drain most quickly like villages) would contain 8/12 cards in 2/3 player games. It makes engines more viable in multiplayer and it can lead in principle to even splits. The same arguments, even splits and better scaling, apply here. I wouldn't want there to be a rush in 3P games just because there are relatively few Timber Rafts and I wouldn't want somebody to lose the game because he lost the Timer Raft split due to bad luck. Just take Sauna as the most radical example. You can totally lose the game in 2P because you lost the split. Wouldn't this behave much better if it were a 4/4 or 6/6 pile? That may be true, and I agree that uneven splits on Sauna do stink. I do have to wonder, though, why Donald X. decided to 8/12 the Victory cards but keep the rest at 10 in every game. There has to be a reason for this. I'll check through the Secret Histories for any clues. Anyway, thanks for answering my questions, Holunder! He mentions here that piles originally had 12 cards. I *think* it was a cost thing. Like, for instance, he mentions as well he went from 20 to 25 piles. 20 12-card piles is 240 cards. 25 10-card pile is 250 cards. For a printer that probably means no difference in cost. 25 12-card piles makes 300 card piles and that could be a new, higher price set from the printer. Of course nowadays we balk not a bit at 500 card expacks but that wasn't always a guarantee. Yeah, I think so too. Let's also keep in mind that Base 1st had a relatively high ratio of terminals so the game was seemingly more centered around the non-Kingdom Supply cards and piles did probably not empty that much. I mean, it is easy to imagine a game with an empty Vassal, Merchant or Harbinger pile but hard to imagine a game with an empty Adventurer or Woodcutter pile. But if we ignore cost considerations 12 is the better number than 10 as you can divide it by not just by 2, but also by 3 and 4.